MIDDLEBURY — Since joining the Northern Lakes Conference in 2000-01, Elkhart Memorial has been the standard for wrestling. The Chargers won their first outright NLC title in 2002 and 12 since then as well as one co-championship in 2013 (Plymouth). Things had a different feel this year as Northridge defended its regular season title with a 210-point effort to clinch the conference tournament for its first NLC title since 2001. Memorial still manged to take second in the tournament with 181.5 points. Goshen (173), Plymouth (171), NorthWood (170), Wawasee (160), Warsaw (72.5) and Concord (68) rounded out the tournament standings. It was an up and down day for area teams as NorthWood placed five into championships matches but yielded no winners. Warsaw went one for one in championships matches while Wawasee placed five and returned one champion. Warsaw’s lone champion was someone with a winning pedigree in Kyle Hatch. The Tiger senior clinched his fourth career individual conference title, this time doing it at 152 pounds. Hatch was a winner by fall in all three of his matches. He started his day with a win over Ben Thomas of Memorial and earned a pin a 24 seconds. That rolled into a fall at 1:15 over Plymouth’s Blake Davis. In the championship, Hatch had a longer match but earned the same result with a fall over NorthWood’s Garrett Griffin (3:45). With all the winning Hatch has done in his career, surely it’s become boring at this point, right? 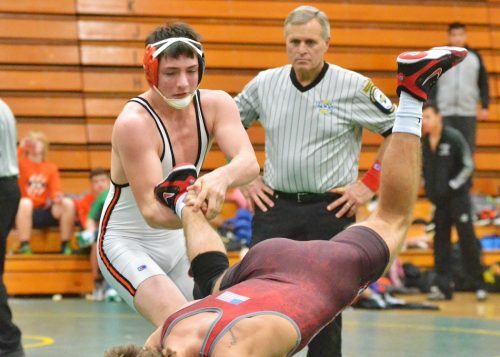 Hatch will roll into next week’s sectional at Plymouth with his sights set on yet another sectional title as he already has three in different weight classes (106, 120 and 138). 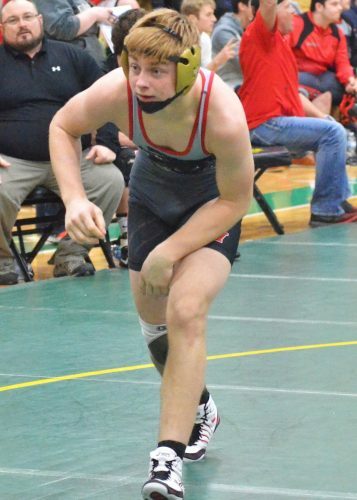 Five other Warsaw wrestlers had the opportunity to compete in the final round, though Hatch was the only competing for a title. The Tigers freshman class came up big as Isaiah Owens (106) and Brock Hogenson (113) each earned fourth in their respective brackets. 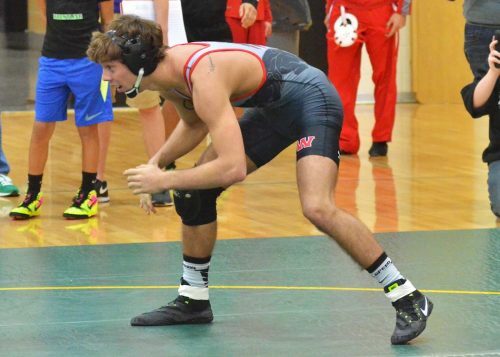 Owens picked up a forfeit after losing his opening match but then won an 18-13 decision over Northridge’s Bailey Olson. Unfortunately an injury cut Owens’ day short before the third place match. Hogenson also picked up a forfeit after losing his opening bout. Following that, Hogenson earned his way into the third place bout with a 17-2 tech fall over Goshen’s Rasheek Bonds. NorthWood’s Cameron Jones then pinned Hogenson in the third place match. Senior Riley Hogenson also claimed fourth place, his coming at 126. The elder Hogenson went 2-2 on the day with a forfeit and a 4-0 win over Goshen’s Enrique Flores before falling in the third place match to Northridge’s Oliver Eveler. Jose Grimmet (132) and Gavin Truex (SO-182) both earned sixth place finishes for the Tigers. Wawasee’s Elisha Tipping took second at 285 for the Warriors. 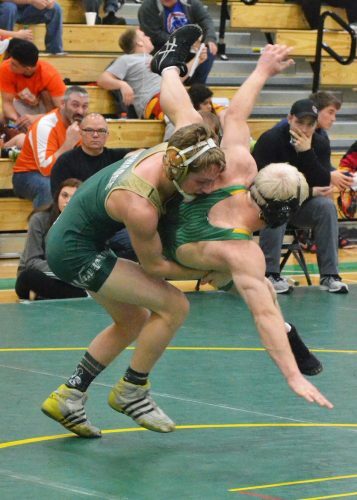 Wawasee, like Warsaw, yielded just one champion on the day in Geremia Brooks. 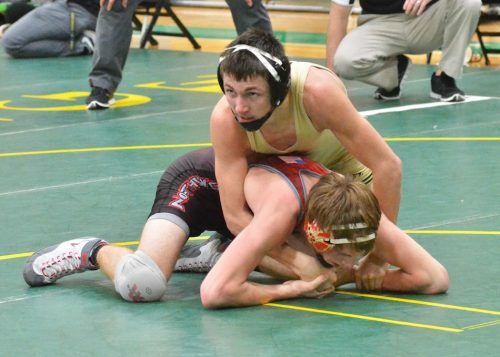 The sophomore was an NLC champion at 113 last season and earned a medal this year at 126. Brooks pinned Warsaw’s oldest Hogenson in 24 seconds to start the day and then pinned Eveler at 3:36 in the semifinal match. Brooks earned a 13-3 major decision over NorthWood’s Hunter Warren in the championship. The championship rounds started with four straight matches that featured Warriors, Brooks being the last of those four. Warrior junior Ricardo Romo was runner-up at 106 following a loss to Fernando Flores of Goshen. 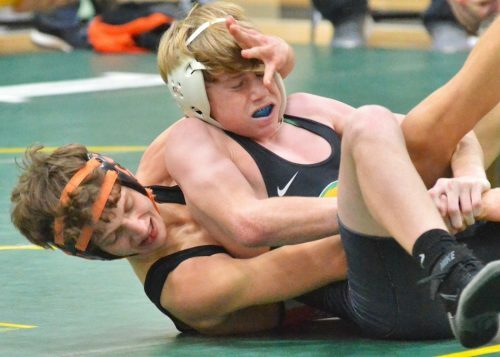 At 113 it was freshman Garrett Stuckman dropping a 7-1 decision in the championship to Northridge’s Evan Beaseley. Sophomore Braxton Alexander settled for runner-up status for the second year in a row upon losing a 10-6 decision to Memorial’s Christian Mejia. In all three of those matches the Warriors represented their respective bracket’s No. 2 seed while the opponent was the top seed. 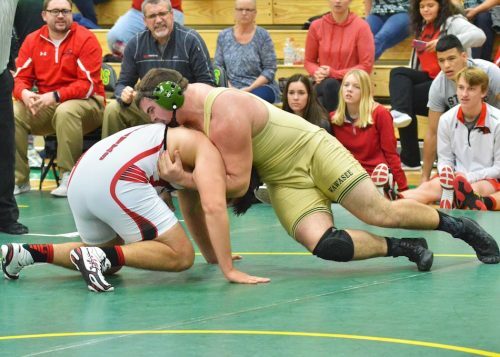 Wawasee’s other finalist was Elisha Tipping, also a junior, at 285. Tipping had his chances but was unable to capitalize and eventually was pinned by top-seeded Erik Contreras of Goshen at the 5:17 mark in the match. Tipping was the No. 3 seed in the bracket he upset Northridge’s Jackson Jacobs with an 11-7 decision to clinch a championship spot. Brooks and Tipping were named All-NLC first team, with Tipping getting the at-large nod. Romo and Alexander received Honorable Mention status. Alex Castro took fourth for Wawasee at 182. Jeremiah Dilley did the same at 220. Isiah Faurote earned a fifth place finish at 132 as did Raymon Torres at 152. Jeremiah Ponsler (160), Xavier Ortiz (170) and Luke Hensely (195) all had sixth place finishes for the Warriors. NorthWood put both Warren (126) and Griffin (152) into championships matches along with Michael Chupp (145), Mikey Edwards (170) and Andrew Miller (220). Jones took third for the Panthers at 113 while Jake Lone did the same at 160. Michael Leonard also earned a third place finish at 195 for the Panthers. Brock Lechlitner (138) and Paul Kinney (182) each took fifth. Austin Bingham (120) and Cannon Yates (285) each earned sixth. NorthWood will head to Memorial for the sectional next Saturday while Warsaw and Wawasee will both compete at Plymouth.